The dust ring you see in the image in similar to the Kuiper belt in our solar system that defines the edge of those bodies with enough mass to draw in all matter in their orbital path. Pluto was downgraded from planet to a Kuiper object due to it’s mass and location in the belt. The belt is comprised of asteroids and dust, the rubble left over after the formation of the solar system. 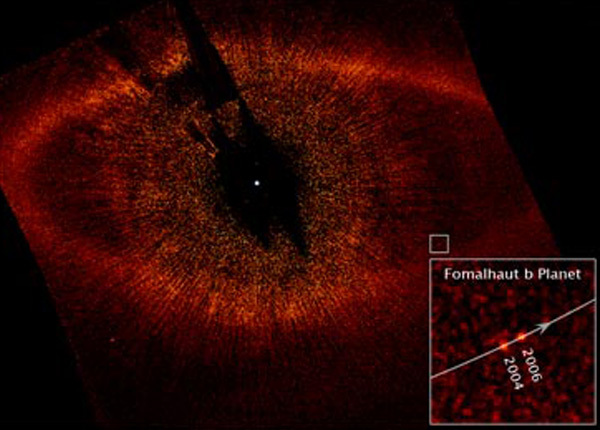 The position of Fomalhaut b on the inside of the dust belt is strong confirmation that it is a planet. And it has been suggested that the planet may be visible in part due to it’s own dust belt or rough planetary rings.